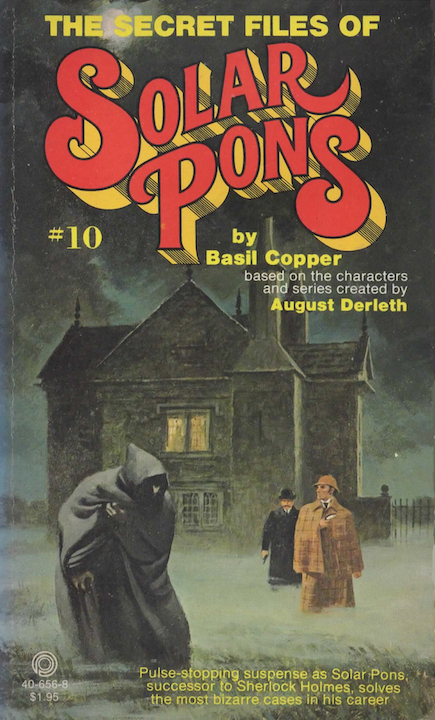 Another collection of Solar Pons stories by August Derleth's successor Basil Copper. The tenth and final book in Pinnacle's Pons series. Come, once again, to number 7B Praed Street, where Solar Pons, the master of deduction, awaits your arrival. Slouched in the cozy cavern of his armchair, his keen eyes fixed on the door, Solar Pons puffs thoughtfully on his pipe, pondering strange and soul-chilling cases. Here is the brilliant Solar Pons at his very best... clutching at elusive clues as he briskly sets apace into the ominous alleyways of old London in chase of crime. If you've not yet joined us in the eternal hunt, you are about to discover a new joy in a tradition that, alas, may have been lost forever, were it not for the reappearance of the remarkably ingenious and incomparable Solar Pons, whose entrancing effect on dyed-in-the-wool aficionados of detection is, indeed, elementary.